Don’t apologize. I chose this for myself. I’m not sad about it. It’s actually exciting to know that with my new stomach, I can still eat things I like. It makes me wonder, is this one of those things that people are going to constantly do–apologize because I won’t be able to eat or drink certain things? Or that I can’t eat as much as I used to be able to? Because I wish they wouldn’t do that. I elected to have this surgery. I chose to change my life in this way, and most importantly, this is how I have chosen to regain my health. Please don’t apologize for something that is in no way your fault. There is absolutely no blame being laid on anyone here. I do not for a minute have regrets about this, other than I wish I’d known to do this sooner. I am really excited about what my future holds now that I have a powerful tool to help me fight La Guerra de la Gorda. I will live longer. My high blood pressure and diabetes have excellent chances of being resolved. I will be able to be much more active and mobile. I will get to do things I could never do previously because of my size. The question is, how do I get people to get away from these hollow apologies? There is nothing that they did that caused me to choose this surgery and subsequent way of life for myself. They were not evil actors in some sort of conspiracy that resulted in my having most of my stomach removed, so why apologize? Don’t feel sorry for me because I won’t always be able to partake in whatever food you might be eating in the quantities you might be eating it in. Don’t apologize because you’re sharing news about trying a new restaurant you went to that was awesome. I’m glad you went there and enjoyed it as much as I did! Don’t apologize for talking about the food I am not hungry for and currently have no physical desire for–my doctor did an exceptional job of removing that part of the stomach that drives hunger so I don’t even want to eat. None of this is your fault. Be proud of me that I decided to take control of my health so that I will be around to enjoy our relationship longer. Feel excited for me because I’ve empowered myself to be a better version of me. Support me along this path I’ve chosen to take because it is not an easy one. Lift me up when I need an encouraging word, and celebrate with me when I achieve even the smallest of victories. Most importantly, love me for the person that I am and that I will become as this process moves along. This entry was posted in choices, head trips, la guerra, post-op and tagged apologies, choices, reactions to WLS, sleeve gastrectomy, sorry seems to be the hardest word, VSG, WLS. Bookmark the permalink. Did they tell you that bypass patients can’t ever eat stuff again? If so…pssht…untrue. I think that when people say they’re sorry, it’s like saying, “I’m sorry that your Grandma died.” They’re just sorry for your loss…not that they did anything ot cause it. So, they’re sorry that you’re being restricted or whatever, even if you did choose it for yourself. 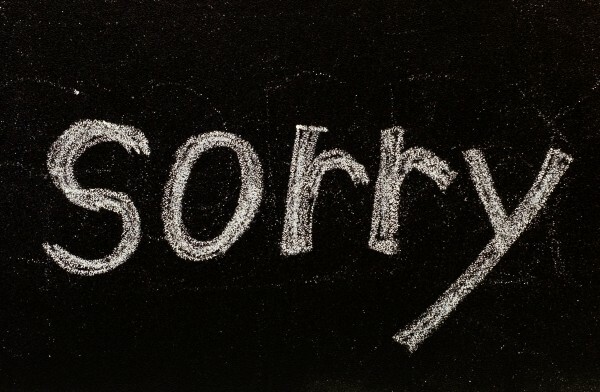 Sorry is probably a lousy word to use for it. It wasn’t so much that they told us RNY patients couldn’t eat stuff, it was more like “if you get an RNY, you can get dumping if you eat X, Y, and Z.” That was enough to turn me off to a bypass.